Many, many thanks to Père Ambroise, Aramatou, Fr Belisario, Chris, Cummar, Eileen, Elena, Elias, Elise, Emily, Fadia, Florian, James, John, Sr Josephine, Juan Gustavo, Judith, Sr Marie-Rosa, Maxwell, May, Mercy, Nico, Norbert, Oliver, Philip, Br Ruben, Teresa, Tim, Ursula & Virginia for giving their 'something' about Mary this month. This photo is of the painting behind the alar in the church at the Franciscan convent in Sießen, Germany. Elena is 21 & from England. Aramatou is 25 & from the Ivory Coast. "Dear children, I have chosen you, my apostles, because all of you carry something beautiful within you. You can help me to have the love, for the sake of which my Son died and then resurrected, win anew. Therefore, I am calling you, my apostles, to try to see something good in every creature of God, in all of my children, and to try to understand them. My children, you are all brothers and sisters through the same Holy Spirit. You, filled with love for my Son, can speak of what you know to all those who have not come to know that love. You have come to know the love of my Son, you have comprehended his Resurrection, with joy you cast your gaze towards him. My motherly desire is for all of my children to be united in love for Jesus. Therefore, I am calling you, my apostles, to live the Eucharist with joy, because in the Eucharist my Son gives himself to you anew and with his example shows the love and sacrifice towards the neighbour. Thank you." Cummar is from Qaraqoush in Iraq & gives her response in English & Aramaic. "La Madonna è una Mamma." Sœur Marie-Rose is from Madagascar. Fadia is 27 & Iraqi Chaldean; she gives her response in English & Arabic. "Because of her yes, we have Jesus, and Mary is the first disciple and that's why we honour her. She's our mother too and that's a great consolation. At the foot of the Cross, Jesus, after giving us everything that he could have given, he gave us his mother and so we always need to take great consolation in that: that's she's always there, praying for us and wanting to support us there and, as Pope Francis says, to wrap us in her holy mantle and to guide us to Jesus, because she had a front row seat. She raised Jesus and as a result she's the perfect mother and so we must never be afraid to turn to her." Oliver is 20 & from London. Elise is 20 & from Canada. Chris is 29 & from Baton Rouge, Louisiana in the United States. "In God I trust .. I pray always to the Virgin and Jesus for everything in our life." Juan is from Venezuela & makes a prayer to the Virgin Mary in Spanish for peace in Venezuela. "Dans notre spiritualité populaire la Vierge est 'Maman' - elle est Mère de Jesus, elle est Mère de Dieu et elle est notre Mère. Nous avons une affection profonde pour la Vierge Marie ... Dans la Vierge nous contemplons toutes les promesses de Dieu faites à l'humanité, tous ce que Dieu veut faire a chacun d'entre nous, voila, ce qu'il a fait à la Vierge. Il nous la met devant pourque la contemplant nous pouissions avoir la certitude qu'Il nous aime et qu'Il veut faire de nous des chefs-d'œuvre comme Il a fait à Marie. Marie est notre miroir mais aussi elle est notre avocate, elle est notre mère qui prie pour nous, que intercéde pour nous. La Madonna per noi è sculoa di santità. Possiamo imitarla e possiamo contare sulla sua intercessione." Père Ambroise is from the diocese of Cotonou in Benin & currently on mission in Rome. He gives his something about Marie in French & Italian. "What can I say about the Blessed Virgin Mary? That she's everything for me, she's everything for all of us: we are her children, she is our mother, she loves us and we remain always in her heart. We should grow in our devotional love for her and belonging to her is particularly true of consecration - she will protect us and she will guide us always to love more and more Jesus Christ her son. ¿Qué digo de la Virgen María? Que es todo. Gracias a ella he tenido toda mi conversión." Padre Belisario Gonzales is a priest from the Missionaries of Charity Fathers & from Costa Rica. "I think Mary is the exemplary man how he is thought by God, and I love her very much, and I think everyone should be in contact with her, like Jesus was connected with her. " Florian is from Bavaria in Germany and gives his response in English & German (impressively simultaneously!). "I want to say to Mary 'I'm so thankful that you said yes to the angel.'" Ursula is from Germany and gives her response in English & German. John is from Northern Ireland. "Our Lady is the one in whom we can find that tender love that all of us are looking for in our lives. So all of us we can trust that in her we find that love that we search for." Hermano Ruben is a brother from the Missionaries of Charity Fathers of Mother Teresa & from Honduras; he gives his something about Mary in English & Spanish. "Holy Mary is of course the Mother of Jesus Christ and for me the one with whom I like to find Jesus. " Norbert is from Germany and gives his response in English & German. "Per me, la Madonna è l'unico essere umano che può avere contatto diretto con Dio, un esempio." "For me Mary is the highest example after Jesus. Maria è massimo esempio dopo Gesù e la prima cristiana." "Our Lady is amazing. Her grace is infinite. I don't know how to say it. She's a wonderful mother ... I love her so much, she has done great things for me in my life which I cannot express." "We go to Lourdes every year for the past seven years .. We love it and we love Mary." Maxwell is from Nigeria (& is Mercy's husband). "Dear children! I am with you also today to lead you to salvation. Your soul is restless because your spirit is weak and tired from all worldly things. You, little children, pray to the Holy Spirit that He may transform you and fill you with His strength of faith and hope, so that you may be firm in this battle against evil. I am with you and intercede for you before my Son Jesus. Thank you for having responded to my call." “Queridos hijos! También hoy estoy con ustedes para guiarlos hacia la salvación. Su alma está inquieta porque el espíritu está débil y cansado de todas las cosas terrenas. Ustedes, hijitos, pídanle al Espíritu Santo que Él los transfigure y los llene con su fuerza de fe y de esperanza, a fin de que estén firmes en esta lucha contra el mal. Yo estoy con ustedes e intercedo por ustedes ante mi Hijo Jesús. Gracias por haber respondido a mi llamado." Sister Josephine is in St Patrick's parish, Chiselhurst, in London. "Our Lady has a special peace for me." "Back home we have a grotto of the Blessed Mother and then I gather little children and I taught them to sing and then every six o'clock I get one of my tenants to pray the Angelus. O my God, you can't believe it, the children easily learn it! 'The angel of God declared unto Mary and she conceived of the Holy Spirit.' They easily learn that and then they sing a song to Jesus." Virginia is from the Philippines. 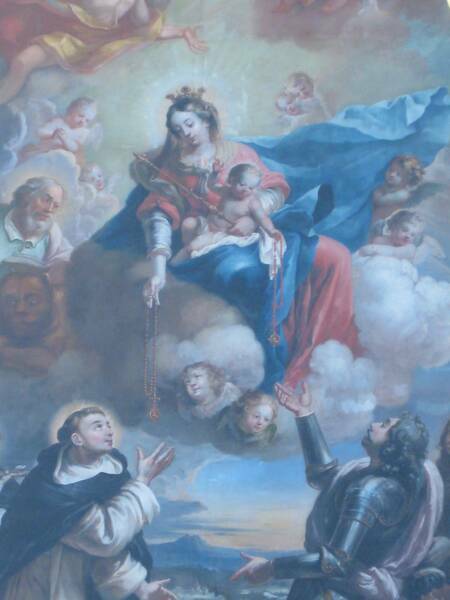 "I've prayed the rosary almost every day of my life. Every Friday and Sunday I go to the church and pray to Mary. I pray for my family, friends and everybody, the whole world - to be peaceful. The whole world is most important, not only for myself." Philip is from the Philippines.